Welcome to NumisMall, your ancient coins superstore! We offer the biggest selection of coins on the web in two amazing stores. Enjoy browsing our huge selection of coins from all over the ancient and medieval world - you will not find this kind of selection anywhere else on the web. In our huge NumisMall store we carry an inventory of over 9,000 coins to suit any taste, including classical, barbaric, Indian and Chinese ancient and medieval coins for the discerning collector. The result of over a decade of study, this work presents in 423 pages a vast range of new material on a super-series of coins which uniquely bridges Hindu and Islamic India from the 7th century CE onwards; its interpretations open a whole new horizon in the numismatic history of early medieval India. The book comprehensively examines the nature and historical context of the earliest native tiny silver dammas as well as all their various Islamic and Hindu descendants, traversing the early coinages of Sindh, Punjab and ancient Gandhara, as well as the later Sindhi, Multani and Ghaznavid types, and subsequent coins from north-western and central India, covering the period from about 600 to 1100 CE. A survey of later coins from western, central and south India is included in the Addendum to the main work for the sake of completeness and to demonstrate the pervasiveness of the tiny silver damma over time and throughout India. Comprehensive descriptions, translations and historical notes are provided for every one of the hundreds of coin types, together with illustrations of one or more specimens of each, including line drawings where appropriate. This detailed study deals with the rich and beautiful early round coinage of China. The book catalogues the coins cast during the three centuries between the appearance of the uninscribed Huanqian bronze coins of Wei State in ca.400 BC and the introduction of Wu Zhus by the Western Han Emperor Wudi in 118 BC. The first half of this book covers the diverse and very popular archaic round coins of the many Warring States. The second half deals with one of the most famous ancient coins – the Ban Liangs of the Qin State, Qin dynasty and Western Han dynasty. Ban Liangs were first cast in the early 4th century BC by the Dukes of Qin State, with many hundreds of varieties cast through the Qin Imperial period (221-207 BC) and the Western Han dynasty (206 BC – AD 9). They were finally demonetized in 118 BC and replaced by the popular Wu Zhus. Immense numbers of coins were produced for over 250 years without any changes in the legend, so they can be identified only by size, weight and style. The study of Ban Liangs remains a very popular and active area of numismatic research, but this research is complicated and generally unavailable to non-Chinese speakers. The information given in this book is based on the most recent available data, and will hopefully provide a useful guide to English-speaking collectors and students of early Chinese coinage. The Numismatic Legacy of Wang Mang is a part of a series of books on the early ancient Chinese coins. Emperor Wang Mang was a fascinating and brutal personality, a visionary but inept leader, a Confucian traditionalist and a proto-Communist, and, finally, a numismatic innovator. Wang Mang introduced three unsuccessful monetary reforms which resulted in dozens of completely new coin types. These reforms led to much suffering and contributed to his eventual demise and death. In form of all these coins, Wang Mang left a rich numismatic legacy. In this book, we review Wang Mang's monetary reforms and his coinage using the authors' decades of accumulated knowledge and the most up-to-date literature available. This book contains over 800 rubbings and photographs of over 300 different types and varieties of coins of Wang Mang, some of which have never been appeared in Western literature. Of notable interest is the detailed study of the prolific Da Quan Wu Shi and Huo Quan coins. Tne Thousand Years of Wu Zhu Coinage is a part of a series of books on the early ancient Chinese coins. It delves into the often-neglected topic of Chinese Wu Zhu coins, which were first cast in 118 BC by the Western Han Dynasty and were produced until the middle of the 10th century, when the last issues were cast by the Southern Han. One Thousand Years of Wu Zhu Coinage is the most accessible and detailed work on this fascinating coinage published to date, reflecting recent advances in archaeological and numismatic research generally unavailable to collectors in the West. Almost nine hundred different types and over eighteen hundred varieties of Wu Zhus and Wu Zhu derivatives are listed in this work, covering over a millennium of Chinese history. All coins are illustrated with high quality rubbings or photographs. The coins are provided with rarity rankings and background historical and archaeological data. This work is the result of collaboration between H. Gratzer and A. M. Fishman, two numismatists specializing in Asian coinage with many decades of experience and accumulated knowledge. 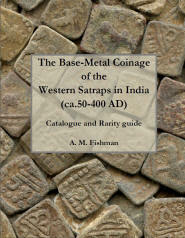 This is the brand new publication - second volume on the coinage of the Western Satraps in India. This 216 page book is the most comprehensive study of the poorly known and understood base-metal (billon, lead, copper, bronze and potin) coinage of the Western Satraps ever written. The Western Satraps (also known as Indo-Sakas or Indo-Scythians) of Gujarat and the surrounding areas in Western India issued a plethora of beautiful rich coinage and sparse and poorly-studied base-metal coinage. This is the perfect guide for the new or experienced collector. The coins of the Western Satraps (also known as the Western Kshatrapas) were issued for over three centuries (from the 1st century AD to the early 5th century AD) and covered thirty eight rulers from two distinct dynasties (Kshaharatas and Kardamakas). 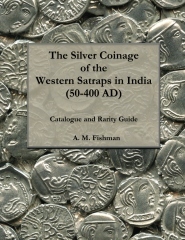 "The Silver Coinage of the Western Satraps in India (50-400 AD), Catalogue and Price Guide"
This 392 page book is the most comprehensive study of the rich silver coinage of the Western Satraps ever written. The Western Satraps (also known as Indo-Sakas or Indo-Scythians) of Gujarat and the surrounding areas in Western India issued a plethora of beautiful rich coinage which until now has not been well understood outside of a small circle of specialists. This is the perfect guide for the new or experienced collector. The coins of the Western Satraps (also known as the "Western Kshatrapas") were issued for over three centuries (from the 1st century AD to the early 5th century AD) and covered thirty eight rulers from two distinct dynasties (Kshaharatas and Kardamakas). * Free shipping will be automatically applied during the checkout. Free shipping offer is valid for North America, Western Europe, Australia, New Zealand and many other countries. This offer can be terminated, changed or denied at any time at our discretion.